This Rollator Bag has been thoughtfully designed to fit onto the popular 4-wheeled rollator walker’s backrest. 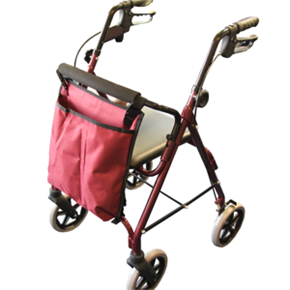 Secured with easy to use side release click lock buckle fastenings, the Rollator Bag is secured close to the rollator walker frame and as such it does not affect the Rollator walkers stability. Durable and lightweight with lots of space for storing your bits and bobs, this Rollator Bag is also available in Black, maroon and navy blue so not only will you be mobile, you'll be stylish too! All you could want from a Rollator Bag and more!